TS PGECET 2019: Telangana State Post Graduate Engineering Common Entrance Test is an exam conducted by Osmania University Hyderabad on the basis of T.S. state higher education board. The TSPGECET exam is conducted in the month of May. Latest Update: TS PGECET 2019 Entrance Exam will be conducted in between 28th to 31st May 2019. Latest Update: TS PGECET 2019 Application Form Available From 13th March (Today). Check the Procedure and fill the form. Latest Update: TS PGECET 2019 Notification Released!! It is a state level entrance exam through which candidate can join in engineering, planning courses, and pharmacy. Candidates who are interested can apply for the TSPGCET 2019. 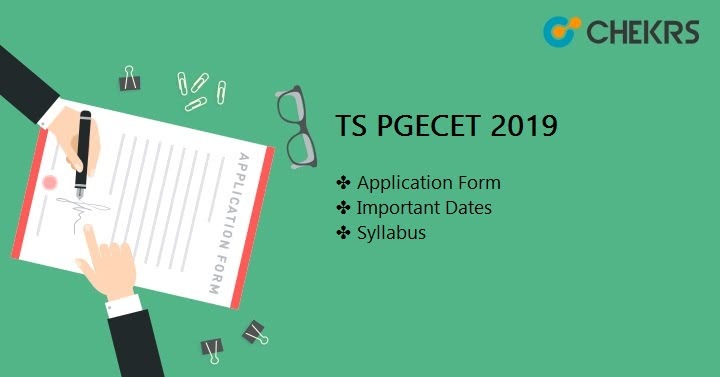 The details regarding the TS PGECET 2019 Apply Online, Important Dates, Syllabus is mentioned below. The TS PGECET releases the notification of the exam generally in the month of the March. An applicant who is interested in the state level exams of the Telangana has to be updated regards the dates. So we provided here the TS PGECET Exam Date. The dates might be changed as per the notification of the PGECET 2019 Telangana. The examination scheduled of the TSPGECET 2019 is conducted into two slots i.e. Morning session and the Afternoon session. Each exam is conducted according to the subject at different days with different slots. So the applicant can see the scheduled according to their course which they opted for their exam. The TS PGECET 2019 Exam Scheduled is provided below the table. Here we are providing the list of Eligibility Criteria for TS PGECET 2019. To apply for the exam, candidates have to check and must fulfill these eligiblity criteria. Candidate should be an Indian citizen and behaving Telangana domiciled certificate proof. Educational Qualification: Graduated Engineering/ architecture/ pharmacy with 50% aggregate marks. Candidates from SCs, STs category Graduated Engineering/ architecture/ pharmacy with 45%. Age limit: Maximum age for SC/ ST/ BC candidates is 34 years and for Minorities /Disabled/EBC the age limit is 30 years. There is no upper age limit for the self-financed students. Non-Indian candidates should fulfill the rules defined by the respective university. For the candidates who are applying for the TS PGECET 2019 exam have to know that the TS PGECET releases the official notification in the month of March. So the candidates who are interested can apply for this. In order to that, we provided the steps to fill the Telangana State PGECET 2019 Application Form. Candidate can follow the steps to fill the application form. The TS PGECET Registration Form/ application form will be released on the 3rd week of March. Candidates can fill the application form till the first week of May 2019 (without late fees) and last week of May (with late fee). Candidates who are applying on the basis of GATE/ GPAT score card are required to fill the separate application form. After filling the form candidates are required to take out the print out of the application form for the future references. Can I fill the application after the last date? Yes. You can fill the application form with late fee till the month of May. Is there any faculty of Application form Correction in TS PGECET 2019? No, Candidates will not be allowed to do correction in their Form after submitting it. How will I know the status of my application?? You will be notified using the text message on the registered Mobile Number instantly after submitting the form. Is there any WAY TO GET Application form through Offline Mode? No, TS PGECET 2019 Application form will be available through Online Mode only. Applicant required for the prepare for the exam as good as possible so that they can obtain good marks in the exam. So we provided here the some TS PGECET Preparation Tips for the applicant who appearing for the exam. Candidates are required to go through the syllabus and cover all the topics. To get the idea of the question paper applicant can solve the last 10-year TS PGECET Previous Year Question Paper, In order to get the good marks in the exam. Practice in the online mode test so that the question-solving ability is resolved on time. Always follow the best and useful book which is relevant for the exam. TS PGECET Exam Pattern is given below, Candidates will get a basic idea about the TS PGECET 2019 Paper. So they can do practices to obtain good marks. The TSPGECET 2019 releases the admit card in the month of May. Candidates who do the successful registration can download the admit card from the official portal of the TS PGECET. Candidates are able to download the TS PGECET Hall Ticket by entering their date of Birth, registration number and the selection of the exam disciplinary. Click on the link” Download Hall Ticket”. A window will open in which candidate required to enter their “TSPGECET Registration Number” and “Date of Birth”. The applicant is required to select the test paper of which he wants to appear in the exam. Then a pop button is shown in which there is the tag of download hall ticket. Click on it. Download and take print out of the admit card for the future use. The authority of TS PGECET releases the answer key in the month of May. Candidates can download it from the official portal of TS PGECET. Candidate will able to check their preliminary TS PGECET Answer Key along with question papers. In case of any dissatisfaction regarding the answer key, candidates can send the mail to the official portal on the time they are provided. The TSPGECET 2019 mostly declares the result in the 2nd week of June. The applicant who wants to see their TS PGECET Result 2019 can see on the official site of the TS PGECET. A merit list is released by the university through which candidate can apply for the counseling. The minimum marks required for qualifying the PGECET 2019 Telangana is 25% i.e. 30 marks out of 120. There are no minimum mark criteria applicable for ST/SC candidates. The list regarding the Telangana State PGECET Cut-off is given below. The Counseling of the PGECET 2019 Telangana is organized by the Osmania University. The TSPGCET 2019 Counseling will be scheduled in the month of August 2018. The Applicant who also have the GATE Score Card can apply for the counseling. When the counseling is organized applicants is required to bring the official document for the document verification. The information provided here as per the official notification is given by the Telangana State PGECET. Candidates can follow the above process regarding the downloading the admit card and follow the counseling process. If they have any queries then they can visit the official site.